I’d never tried venison before but, after watching a programme talking about how lean it is, I stumbled across a recipe for venison in one of my recipe books. So here it is – if I were to ever host a dinner part on come dine with me, this would be my chosen main to impress. From “the diabetes weight loss diet” available here. In a liquidiser, puree half the blackberries with the cider vinegar and all but 4 tablespoons of the stock until smooth, then pass through a fine sieve to remove the pips. Pour the blackberry puree into a saucepan and cook over a medium heat until reduced to 200ml – about 15 minutes. Set aside. Heat half the oil in a large saucepan, add the spring onions and cook for 1 minute. Add the reserved 4 tablespoons stock and the spring greens and stir to combine. Cover and cook over a medium heat for 7 minutes until the greens have wilted. Fold in the toasted almonds. Meanwhile, heat the remaining oil in a large non-stick frying pan. Season the venison generously with pepper and cook the paillards over a high heat for 1 and a half minutes on each side. Cook them in two batches if necessary. Set aside but keep warm. Add the redcurrant jelly to the venison pan with a couple of spoonfuls of blackberry sauce, scraping up any bits and bobs stuck to the bottom of the pan. Add the remaining blackberry sauce with the reserved blackberries and cook until the jelly has melted. Check the seasoning. Spoon the greens onto four warm plates and surround with the blackberries and their sauce. Top the greens with the venison and sprinkle with chives, if wished. Serve with warm new potatoes. 400 calories; 13g fat; 1g saturated fat; 35g carbohydrate; 0.27g sodium. So you have probably noticed from my picture that I altered the recipe to my taste a little bit. I changed the vegetables (sorry everyone, I’m not a fan of veg and its lucky I like any vegetable) and I didn’t add the almonds. I also oven cooked the new potatoes with some rosemary, just because that’s what I do. 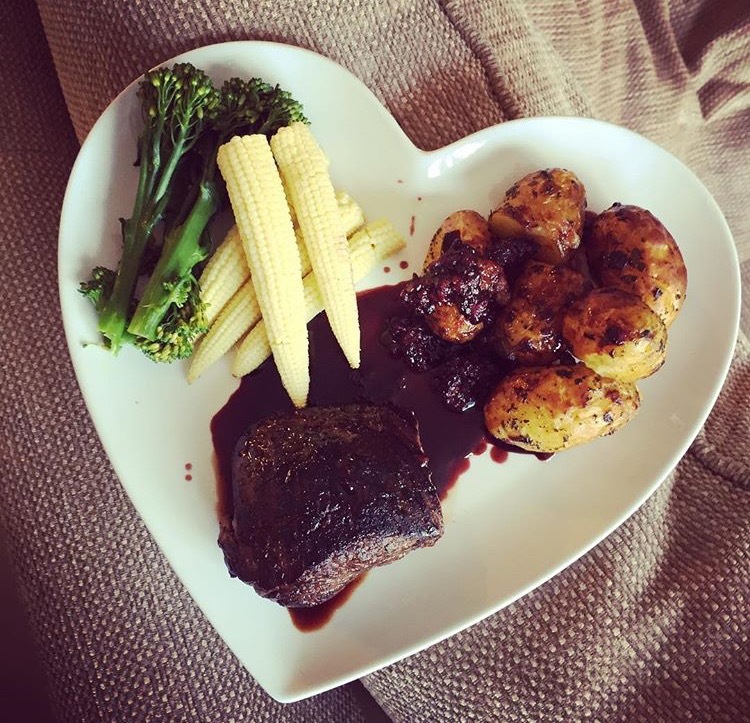 This is a personal favourite of mine and I hope you all find the same pleasure in tucking into this beautiful meal as I did when i first discovered the recipe!